Professor Kazunori Kataoka is one of the world's leading polymer chemists, having developed specific polymers for biomedical applications. His nano-transporters are remarkable as they are based on long-chain molecules, i.e., polymers, which are used for the targeted delivery of anticancer drugs to tumors and for the transport of genetic material in gene therapy. He is a pioneer of a new concept in which the drug is enclosed in micelles. These are aggregates of specially developed polymers. It is possible to specifically guide these nano-transporters to affected tissues or organs. For this purpose, they need to circulate in the blood for a relatively long time so that they eventually accumulate in tumor tissue. Several differently designed polymer micelles that Kataoka has developed for cancer therapy are currently in clinical trials in various countries, including the UK and France. Some of these polymer agents are close to actual application. This would confirm the ultimate breakthrough of this concept. Professor Kazunori Kataoka has pursued his scientific career mainly in Tokyo, and he has received worldwide recognition and held several guest professorships at European universities. He is Professor in the Department of Materials Engineering at the University of Tokyo and member of numerous scientific societies in Japan and the USA. 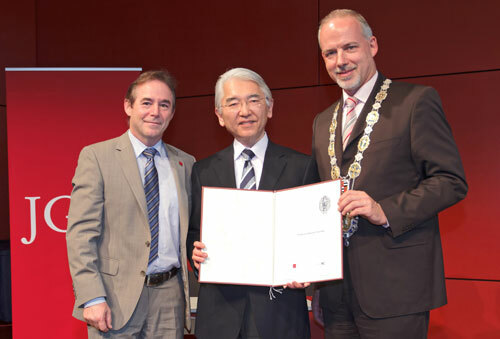 He has received the highly prestigious Humboldt Research Award for research in collaboration with members of the Mainz-based Collaborative Research Center (CRC) 1066 on "Nanodimensional polymer therapeutics for tumor therapy" and also the NIMS Award of the Japanese National Institute of Materials Science. There are several areas in which Kataoka's work coincides with the research being conducted in Mainz with its long tradition of experimentation with self-organizing nano-structures based on polymers. Polymer-based medications and nano-transporters based on polymers are regarded as a core area of current polymer research. Corresponding strategies are not only being developed at JGU, but also at the Max Planck Institute for Polymer Research as part of the CRC 1066, which is funded by the German Research Foundation (DFG). Crucial to the success of this research is the close cooperation with medical groups at the Mainz University Medical Center within the CRC. The first joint projects with the Kataoka work group have already started and include both exchange of PhD students and joint publications. Press release "Gutenberg Research Award 2015 goes to polymer chemist Kazunori Kataoka and theologian Kwok Pui Lan"